There’s something so magical about spring in Savannah. The skies are clear, the flowers are blooming in vibrant colors, and it’s hard to find a reason to stay indoors. For the spring months, Savannah is at its absolute best, which is why so many people come to visit during that time. From March to early May, enjoy all the perks of spring in Savannah. Spring is that golden time when the weather is at that perfect temperature before it begins to heat up and humidify in summer. Temperatures are steady in the lower and upper 70s throughout March and April, and begin to climb up starting mid-May. We do see a handful of rainy days in the spring, but most times it clears up that same day or by the next day. And if you do get stuck with rainy April showers, just remember the old saying and know that more May flowers are just around the corner. It’s most likely that the flowers are already in full bloom well before May rolls around. Our famous azalea bloom begins in early March—sometimes even as early as late February—and lasts through early May. These colorful beauties can be seen all over Savannah’s historic district, as well as big Forsyth Park and sleepy Bonaventure Cemetery. 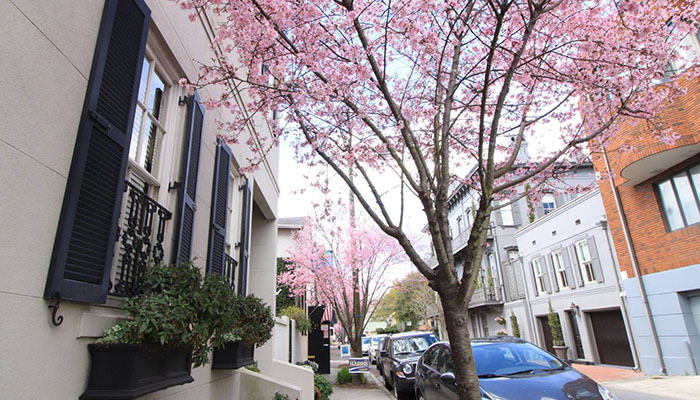 Plus, other flowers like camellias and dogwoods are also popular in the historic district, and create a dreamy backdrop for your stroll around Savannah. When the weather is nice we take full advantage of it, which means that spring is one of our busiest times of year for fun, outdoor activities. Of course, our St. Patrick’s Day is the most popular with green fountains, an annual parade and downtown celebrations. But we also welcome the annual Savannah Music Festival, art walks, and the SCAD Sidewalk Arts Festival this time of year. So have we convinced you yet? There’s only one thing left to do: plan your spring vacation! Savannah’s waiting for you.